What rests deep within your consciousness throughout the day? Worries? Hopes? Fears? Successes? Failures? Your “To Do” list? What if each day were filled with a deep consciousness of God? What would that look and feel like? What would it take for that to happen in your life? Maybe you are already there. But if you are like me, I am always trying to deepen my mind and heart with a sense of God’s presence. 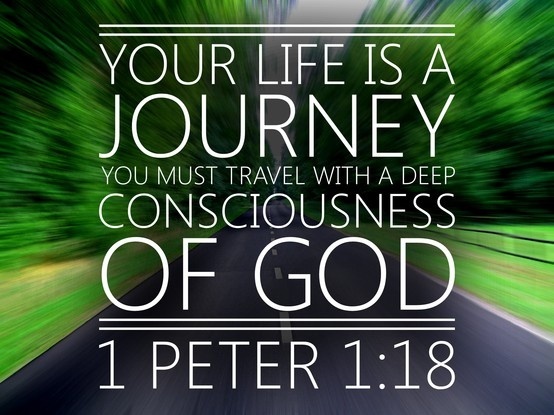 Your life is a journey you must travel with a deep consciousness of God. It cost God plenty to get you out of that dead-end, empty-headed life you grew up in. …Now that you’ve cleaned up your lives by following the truth, love one another as if your lives depended on it. Your new life is not like your old life. Now, your Bible may not read exactly this way. This is a translation by Eugene Peterson which you probably know of as The Message. I love going to The Message to read all the Letters in the New Testament. I find that Eugene Peterson has an increible knack for communicating the essential message of these Greek letters for us today. And the passage above is a great example. Your life is a journey you must travel with a deep consciousness of God. Yes! That is what I long for. That is what I need, what I strive for. Prayer and meditation help. Reading scripture helps. Reading certain theologians and authors helps. Slowing down to think and reflect helps. Engaging in missional work helps. Writing really helps. For me, each of these practices helps to calm my spirit and focus my mind. They help me sift throughout the busy-ness, the clutter, the problems and tasks of each day to find God within each moment. What practices help you travel through life with a deep consciousness of God? Take a moment and consider that question. No, I am not perfect at it by any means. Sure, I forget, get sidetracked and distracted….all the time. I think that is pretty normal. Being reminded of what works, getting back to what works, and discovering new practices which help, is part of the journey of cleaning up my life, of following the truth and of stepping more fully into the new life God has for me. I suspect that if you take this challenge today, you just may discover that God rests a little deeper, a little stronger, a little more fully within your consciousness. And I’m willing to bet the same will be true for the other person as well.